Came to the end of my first week in Thailand. I can’t believe it’s just over a week since I left dear old damp Dublin. Settling into the ways of being in Asia. Once my jetlag was over, on Thursday, I seem to get right back into the Asian way of doing things again. it seems like I’ve been here for ages. My body clock seems to have adjusted, one day at a time! and I’m sleeping well again. My tummy makes the occasional grumble but no outright rebellion yet. What goes in, stays in; except for the natural, you know what, and even that’s ok. I have gone right out of my safety zone in food areas. I generally eat at Thai places and street stalls and avoid Westernised places, except coffee shops, of course. I found a little family run restaurant near my apartment a few days ago run by a delightful Thai woman who wanted to practice her English. She comes from a small village way up north, from one of the hill tribes I think, as she didn’t look like the locals do, but, what do I know! As the menu was in English, I asked her to choose a typical Thai dish for me. It was ok, mainly steamed or sticky rice and a few smaller dishes. Nothing to write home about, really. Which is probably just as well and I can’t even speak Thai. To be honest, I’m not all that mad about Thai food. I don’t have anything against it and there are several dishes I really enjoy but I rarely get the same satisfaction from a Thai meal as I would get from a Chinese or Indian meal. Maybe I haven’t eaten at the right places yet. I ventured into another place a few days ago because they had a picture menu. I pointed to something that looked nice and tasty and waited in Pavlovian fashion for my meal to appear. I was hungry enough to eat a nun’s arse through a convent wall. I think it was concocted by the Dark Lord in the bowels of Mordor because what appeared on my plate looked absolutely foul. I haven’t the foggiest idea what it was but it looked like something you would find at the bottom of a politician’s unconscious. It looked, smelt and tasted rank. I don’t even know if if was animal or vegetable. It might have been the fermented gizzards of a psychotic sheep for all I know. There were long strips of what looked like very wide flat pasta but felt rubbery to the bite and was very chewy with a fishy and (full) baby’s nappy flavour. There were also black things that looked like burnt peppers but I swear they moved when I was looking at them out if the corner of my eye. They had a strange taste. As did the blobs of ancient polystyrene about the size of a rat’s heart. They were very crunchy with something acrid in the centre. I had an awful thought that they might be deep fried bugs so deciding that blissful ignorance would be the best policy, swallowed without having a look. I finished about a third of it but then could eat no more and left before the meal left me. I can’t remember the last time I left a plate with food on it. Whatever was in this meal, it overrode my famine and greed gene. On a positive culinary side, we get our breakfast and lunch at work and what a spread it is. Lunch is several courses with an amazing salad bar and some Thai and western dishes. I usually eat a very light lunch but am beginning to eat a larger lunch now and smaller evening meal. That’s it! Enough of the food stories, already. We’re in the rainy season or Monsoon here in Chiang Mai. Rainy season however does not mean drizzle for days on end, like it can in Ireland. The normal pattern over the last few years has been clear mornings (with better than dry season visibility and mountain views), clouds in the afternoon and subsequent rain, dry evenings, occasional rain at night. Still, weather is ruled by chaos principles so there can be clouds and rainy days for, mostly short, continuous periods. Saturday started out ok, a bit cloudy but bursts of sun. I was up in the mountains on my motorbike and halfway there the heavens opened. I stopped off at an observation point, an open building on huge stilts giving a great view over the mountains and Chiang Mai below. There, I waited out the deluge and had a grilled chicken leg on a stick, delicious, and some ice cream. Amazing how the Thais avail of any and all opportunities to make a buck. There were loads of stalls at the observation point selling food and trinkets. There was even a guy who painted very fast and very good portraits on an A3 sketchpad. It got me thinking how very unentrepreneurial Irish people are in comparison. I used to regularly cycle around the Phoenix Park in Dublin, a magnificent park and the largest inner city enclosed park in Europe. It’s a great place to hang out, go for walks, see nature etc. yet, apart from a few tea shops, and very good ones too it must be said, there’s very little in the way of places to get a cup of tea or a snack. On the other hand, it gives the place an uncluttered, unspoiled and refined air. This is most definitely not the case in Thailand. In a short while, the deluge ended and I continued on my way. Before you could say “how spicy is this” the rain was gone and the roads dried in front of my eyes. I went up the mountain to see a Buddhist temple or Wat. 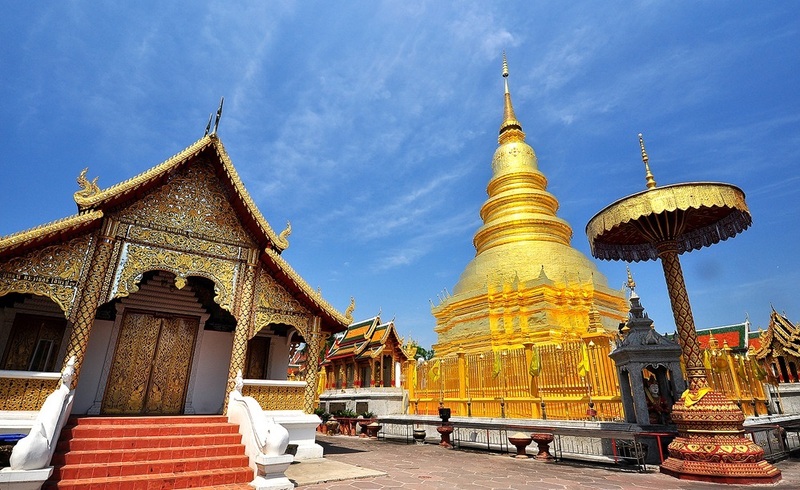 This one, Doi Sathep, was one of the main temples in the area. It was gigantic with dozens of big ornate buildings on the site. Naturally, there was a wee coffeeshop selling seriously good and strong coffee. I had a cuppa and watch the Thais watching the tourists watching the monks who just got on with their own business and ignored everyone else. More power to them. According to legend, a monk named Sumanathera from the Sukhothai Kingdom had a dream. In this vision he was told to go to Pang Cha and look for a relic. Sumanathera ventured to Pang Cha and found a bone. Many claim it was Gautama Buddha’s shoulder bone. The relic displayed magical powers: it glowed, it was able to vanish, it could move and replicate itself. Sumanathera took the relic to King Dhammaraja, who ruled Sukhothai. The eager Dhammaraja made offerings and hosted a ceremony when Sumanathera arrived. However, the relic displayed no abnormal characteristics, and the king, doubtful of the relic’s authenticity, told Sumanathera to keep it. King Nu Naone of Lan Na heard of the relic and bade the monk to bring it to him. 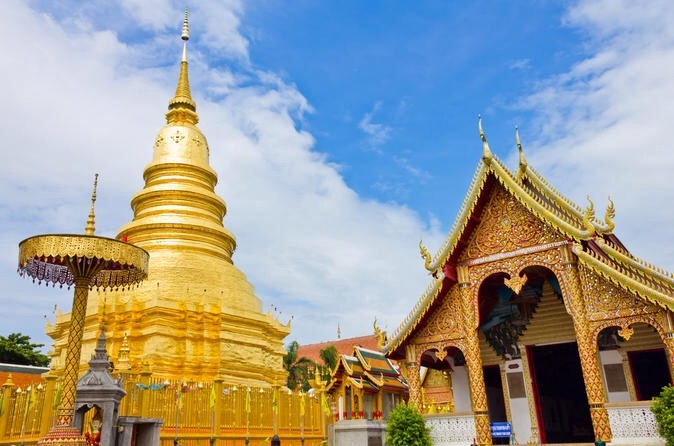 In 1368, with Dharmmaraja’s permission, Sumanathera took the relic to what is now Lamphun, in northern Thailand. Once there, the relic broke into two pieces. The smaller piece was enshrined at a temple in Suandok. The other piece was placed by the king on the back of a white elephantwhich was released into the jungle. The elephant is said to have climbed up Doi Suthep, at that time called Doi Aoy Chang (Sugar Elephant Mountain), stopped, trumpeted three times, then dropped dead. This was interpreted as an omen. King Nu Naone immediately ordered the construction of a temple at the site. Make of this what you will. Sure puts the moving statues of Ballinspittle to shame! The next day, Sunday, yesterday, I biked down to the old city and parked my bike, hoping fervently that I would find it again as it’s very easy to get disorientated here, I find. There seems to be dozens of Wats in the area and I visited a few. I really liked the rundown nature of most of them. They weren’t really uncared for or ignored; more an everyday comfortable shabbiness. They were after all, working enterprises housing a lot of monks and other staff. One of the Wats had a coffeeshop so naturally I went in to cool off and chill a bit. It was a lovely place with the usual Thai air of refined calmness and the smell of incense and old teak. Four young men were behind the counter serving; I was one of the few customers there at the time. They were delightfully friendly and helpful. I ordered an iced coffee and some cake-like confection concoction. While I was standing there at the counter, taking in the atmosphere, a young monk who sat nearby invited me to join him at his table. He was 23 and studying at the university of Chiang Mai. He said he became a monk at a very young age. I thought he said 7yo but not sure if I misunderstood or not. He was very open and smiling and I felt my spirits lift just by taking in his purity; that word seems to sum up how I experienced him. We chatted for a while and then he had to leave to attend to some monk duty. This friendly smiling young man left a far greater impression on me than all the wats and enormous golden Buddhas. To tired to write about mongrels, mosquitos and motorbikes. Lots more to come later…. 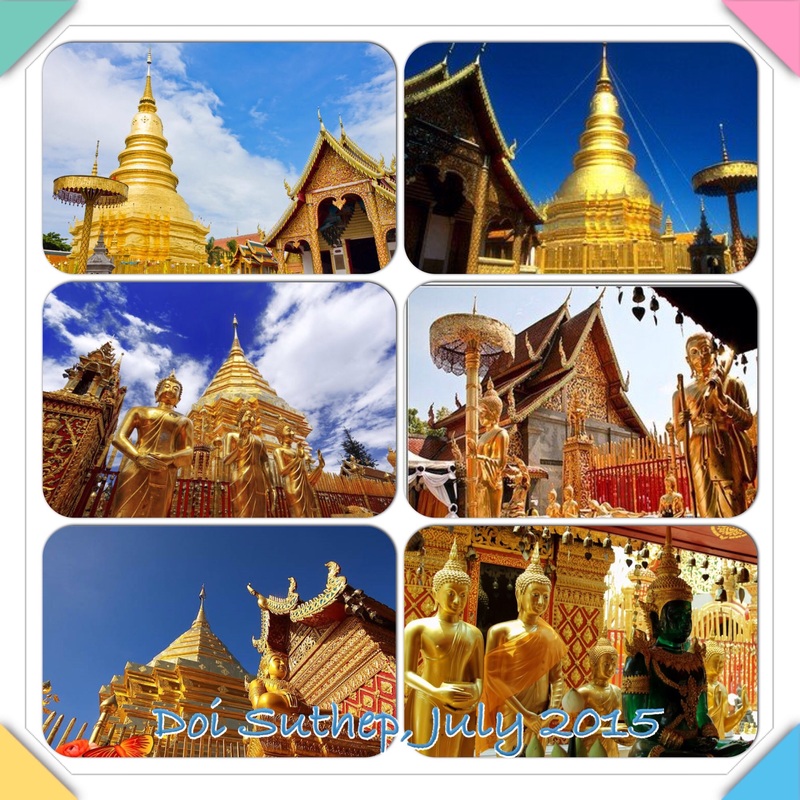 I came across your blog, I enjoyed reading about your travelling in Thailand, very interesting.